As you probably all know, TAG has been participating in the Montreal @ Play Festival. We’re hosting ARCADE 11, which has been a great hit and to finish the event with a well-deserved finale we would like to invite you all to a Micro Talks evening on March 8th at 6pm. 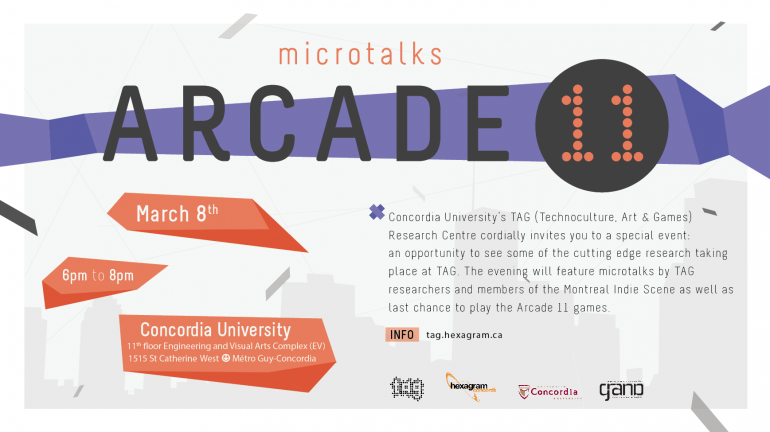 Beside the games of ARCADE 11 the event will be featuring microtalks by TAG Researchers: it is an opportunity for people to see some of the cutting edge research that members of TAG and the Montreal Indie Scene are conducting. We hope to create more interest around TAG members and their research and we want to get people excited about the work we’re doing at the university. Jessica Rose Marcotte will be presenting on “popular technoculture, arts and gaming,” which is like popular science, only different. In her thesis, as well as a variety of her other projects, she attempts to take the perspective of the unitiated in order to share knowledge that is otherwise obfuscated by technical jargon. Game scholar Stewart Woods, in his monograph Eurogames, explains that in the Western world, there currently exist two major sub-categories of hobbyist board games, Anglo-American and European. While these terms are geographical, they now refer to different styles of design. Woods’ historical quantitative analysis stops short of cultural critique, but his discourse mirrors the online board game community’s pride in Eurogames for their ability to design non-violent representation. While Anglo-American games are said to be formally constructed to depict belligerence and little more, it will be argued that they are capable of doing so with nuance. In contrast, Eurogames have developed new forms of play which abstract or excise violence from violent histories, re-writing and whitewashing the past events, and consequently producing problematic depictions. Renee Jackson will be presenting “Wrestling With Social Impact”, a brief story about her research on the mobile video game application, Get Water! This is a game about a young girl from India, who gets pulled from school to get water for her family. Where’s the magic? Isaac Lenhart will be delivering a short talk about how the use of electronic objects and specifically game objects contributes to a magical viewpoint of game interaction. Carolyn will be presenting on her PhD research on Skyrim modding (modding refers the modification of an existing game or engine). Her project explores the relationship between the game industry and modding communities, and the role of mods as cultural and material objects capable of expressing and subverting social norms. Pierson’s present research project starts and ends with a simple question: ‘how do we play with the bomb?’ His presentation will detail his plan to explore how ethically disruptive gameplay collides with local multiplayer sociality by observing participants as they attempt to outwit and outlive their opponents in the apocalyptically Machivellian ‘genocide-’em-up’ nuclear war simulation game DEFCON. Thorsten’s research focuses on how moral decisions are being portrayed in games, how the games industry deals with corporate responsibility issues, and how game companies regulate toxic gamer culture.